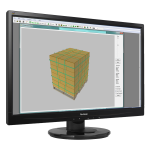 The Pallet Design System™ (PDS) is a product specification tool, an engineering design tool, a professional marketing tool, and an educational tool - all contained in an easy to use software package developed for the wood pallet industry. Since its introduction in 1984, PDS has developed a highly respected reputation throughout the material handling industry. Members of Timcon can have access to PDS at a reduced rate via our industry colleagues at the NWPCA. Note: Additional installations for $250 per under a “Basic” license and $300 under a “Server” license.